SAL DeTRAGLIA'S VIRTUAL TAPAS BAR: MY CHRISTMAS LIST. Christmas in Spain is fun, because it provides many opportunities for amusing observations. Listed below are some of mine. I had—at one point—naively intended to publish each of these as its own stand-alone post, but that ambitious goal collapsed under the demands of my day-job and two year old daughter/dictator. Of course, I’d be willing to un-collapse it if someone were to offer me a book deal. Someone? Someone?? ANYONE???!!! * Perfume commercials appear at night. Afternoons, on the other hand, are the domain of children’s toy commercials. These commercial usually run about fifteen seconds; which is still eleven-times the attention span of the average 8 year old. What amuses me about toy commercials is their “fine print.” Apparently, advertisers are legally required to disclose, in writing, the toy’s price range (e.g., “More than 30€” – “More than 60€” – “You might want to consider a home equity loan”) and whether it requires batteries. Of course, these disclaimers—which are written in white, 2 point font at the bottom of the screen—appear and disappear in three beats of hummingbird’s wing; but that seems sufficient to satisfy the authorities. On the bright side, I’ve yet to see a Christmas-time toy commercial in French. 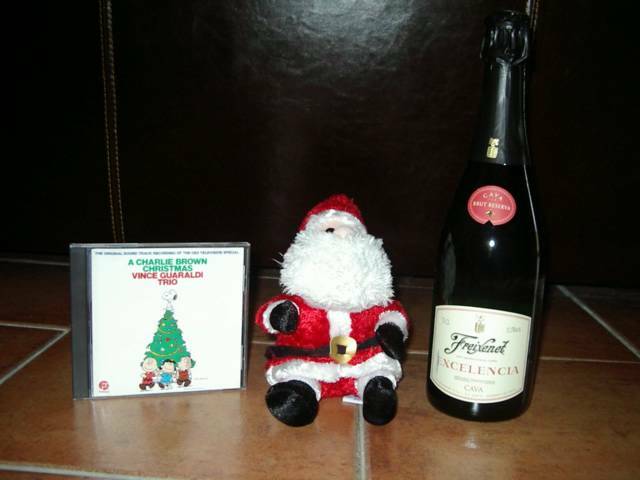 * Freixinet (the famous cava producer) airs the best Christmas commercials of any company in Spain—sez me! Each year, they break the bank to hire a big-name celebrity to star in the latest installment. This year’s celeb de jour is Pierce Brosnan. Freixinet then produces a minute(s)-long extravaganza of televised kitsch that is best described as “Bollywood meets Barcelona.” Freixinet’s Christmas commercial is a much-anticipated event. The company even takes out newspaper advertisements announcing when, and on which channels, it will air. Tellingly, they don’t disclose how many bottles of Freixinet are in Pierce Brosnan’s personal wine cellar—although I suspect that it’s considerably less than the number of Dom Perignon bottles. * In case you’re wondering, it’s pronounced “fresh-in-NET.” If you’re wondering further, cava is Spain’s version of champagne. * Codorniu is Freixinet’s main competitor in the cava market. Its annual Christmas commercial tends to be as lame as Freixi’s is dazzling. * El Gordo is coming!!! And no…I’m not talking about Santa Claus. * Speaking of Santa Claus, he might want to hire a new Brand Manager for the Iberian market. Why? Because here in Spain, Los Reyes Magos (aka, the Three Wise Men) are more popular. For those of you who slept through Sunday school (and/or Monty Python’s The Life of Brian), the Three Wise Men are the guys who followed the North Star to Jesus’s (and/or Brian’s) manger in Bethlehem. US children may be shocked to know that they actually have names: Gaspar, Baltasar and Melchor. Their day is not December 25, but rather January 6. More on this in a later post…maybe. * One of the Three Wise Men (Baltasar) is black. Yet despite the recent immigration of thousands of sub-Saharan Africans into Spain, Baltasar—when appearing in parades or shopping malls—is usually portrayed by a white man in black face. Can you imagine how this would go down at a J.C. Penny’s in Little Rock, Arkansas?! * I can deal with Santa Claus’s tepid Iberian popularity rating. What depresses me to no end, however, is the absence of Halloween in Spain. I feel like—each year—I’m robbed of my one and only opportunity for state-sanctioned cross-dressing. * I may be the only person in Spain who owns Vince Guaraldi’s Charlie Brown Christmas CD. This astounds me. How can a nation celebrate Christmas without Vince Guaraldi?! * Ditto regarding Rankin-Bass’s Rudolph the Red-Nosed Reindeer. C’mon, Spaniards! Buzz Lightyear ain’t got nuthin’ on Yukon Cornelius. * At least once during each Christmas season, some Spaniard will come up to me and ask, “What’s Kwaanza?” It’s good that they ask me, instead of Baltasar. Hi Sal, They are telling us here in Almeria to drink Valencian cava. The Valencians are on our side, apparently. Spain's other distinction at Christmas is the truly terrible polverón flour-bun things that takes up to an hour to gum off your teeth and palate. Even a shot of the complimentary anís seco at the bank won't shift it. I'm thorry, I thed 'prethtamo'! I'd sign this 'Lenox' if this blogger-thingy lets me..
BTW - I post at www.theentertaineronline.com when the fancy takes me..
Nice to "meet" you, and welcome to the VTB. I like it when people just pop in from unexpected places. It's nice to have a little confirmation from time-to-time that some people outside my extended family read my silly posts. You are spot-on about the dreaded Polerone. I've always prided myself on being a person who eats (and likes) almost everything. But truth be told, I've found polverones to be disgusting from the first sandy mouthful. Sugared flour, indeed. Polverones do have one redeeming aspect. It's great fun to give them to unsuspecting foreign visitors. Plus, any excuse to have a glass of anís seco is equally welcome. BTW...your bank provides glasses of anís seco? I want to open an account there! I don't need another toaster, but a snifter of Chinchón is the gift that keeps on giving. Thanks for taking time to peruse my silly blog and post a comment. And hey everyone...go to http://www.theentertaineronline.com/ and check out Lennox's site. It's full of good, interesting information on happenings in Spain (and in particular, Almería...a place that few Americans have heard of...but that will change someday).